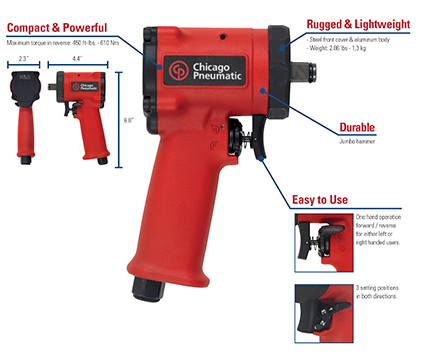 The new Chicago Pneumatic CP7732 and CP7731 are ultra-compact and powerful metal impact wrenches. At only 4.4" long (112 mm), and 2.86 lbs. these stubby impacts are ideal for very restricted areas, like transmission engine, and interior work. Since this tool is the size of your fist, anywhere your hand can fit, so can these! Small, yet powerful, the CP7732 1/2" stubby impact offers an excellent power-to-weight ratio: 450 ft-lbs. (610 Nm) of torque at only 2.9 lbs. (1.3 kg). Additionally, both the CP7732 and CP7731 provide user-friendly features which includes a one hand operation trigger with 3 position settings in forward and reverse. It's a must have in every mechanics tool box for work in tight spaces that are unreachable with a standard ½ impact wrench!